Deer hunting has been one of my main passions since I started bowhunting at the age of 16. After being raised a duck and goose hunter and having plenty of success at it, bowhunting presented a welcomed challenge. 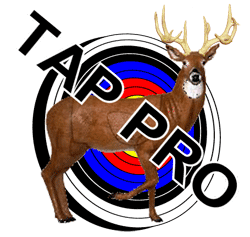 It was fun to go through the learning stages of trying to outwit deer and mastering archery to the point where I became consistently successful at it. After 22 years of bowhunting deer, I decided to try something new and exciting; I decided to try public elk hunting in the Rocky Mountains of Colorado. Elk hunting had always been one of my bucket list items, and I wasn’t getting any younger, so it was time to make it happen. I knew it would be an awesome experience to backpack in the Rocky Mountains and maybe even get a shot at one of the largest big game animals in North America, so the coordinating of the hunt began. As with many things in life, if you’re going to try something new and have a friend or mentor who has done it before, you’ll save yourself a lot of trial and error learning. My buddy Shawn was this friend. 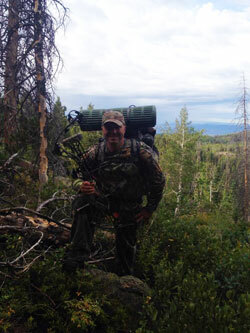 Shawn has an extreme drive when it comes to hunting and has taken many Boone and Crockett whitetails along with an elk, a mule deer, a timber wolf and a mountain lion. He did the research in previous years and went solo to many states he had never hunted in before and had success in taking various animals. When I told him I wanted in on the next elk hunt he said alright and the preparation began. One of the first things Shawn told me was to start getting in shape. The higher elevations and thin air of the Rockies has less oxygen in it so your body has to work twice as hard to do the same physical tasks. He also had me stop by his house to check out equipment and supplies needed for our trip which he laid out on a table. I was shocked at how much I not only would have to buy, but also fit into a backpack. Some of the essential pieces of equipment were: filtration device for drinking water, a mini butane boiling system to cook dehydrated foods with, dehydrated foods, meal bars, warm weather clothing, cold weather clothing, sleeping bag, rain gear, game socks (for meat), backpack, flashlights, gps, maps, water bottle, tarps, cordage, coolers, etc. Well, after a while, I accumulated what I needed and it was time to move on to the next step, physical training. I really wanted to get in great shape for the trip, but it didn’t happen. Being married, working, and having a 1 year old made it tough to find enough free time to hit the gym so I figured I’d roll the dice on my body surviving the mountains. I was going to be going with Shawn who was 40, our friend Jerry who was in his mid fifties and my buddy Joe who was also in his fifties. I figured the climbing would be tough but I’d manage and if a bear or mountain lion charged us, all I would have to do is outrun one of the older guys, lol. One thing I knew I had to do though was study the area we were going to hunt and scout for spots. Being a bit of a computer guy, I have learned the benefit of using Google Earth for scouting. I knew how whitetails worked terrain and figured I’d apply some of the same principles to elk hunting. I downloaded maps of the unit we were going to hunt and overlayed them onto the mountains. I studied the terrain, looking for pinch points, saddles and watering holes. I knew what roads we were going to be on and where we planned on parking so I figured I’d limit my hunting spot radius to about 2 or 3 miles. After quite a bit of computer time, I felt like I had about 5 solid spots to hunt so I was pretty happy. Being in the mountains can be pretty scary, especially if you get lost so I knew I needed a gps software solution. I knew of onXmaps and the quality mapping that they provide for Garmin devices like mine so I went to their site. I purchased and downloaded their hunting maps for Colorado. The maps contained game unit boundaries, private property boundaries, hiking trails, streams and more which I knew would be priceless to have while in the field. Due to the fact that “luggage flies for free”, we decided to fly with Southwest Airlines. We crammed all that we could into coolers, not luggage, and took the more expensive items and other packing overflow in our carryon bags. We choose coolers for luggage in case one of us bagged an elk. The flight landed us in Denver where we rented a brand new Ford F-150 with 4 wheel drive. We started the 3 hour trip to the Steamboat Springs area. While driving through the beautiful countryside of Colorado, my ears were popping like crazy while no one else’s were. A little anxiety started to set in on how I might react to my new found altitude while in the mountains. When we arrived at Steamboat Springs, we bought our tags, picked up some groceries and headed out to the 9 mile backcountry mountain road that would lead us to our first hunting spot. Shawn had mentioned that this road might not be in the best of shape so we knew this would be an adventure and it was. The road was horrible. It was nine miles of deep ruts (that almost bottomed us out) and boulders, yes boulders. It was like the once nice road was washed away and revealed a ton of boulders ranging in size from a large garbage can to a small four wheeler. We had to have a spotter so we could maneuver around these giant rocks without damaging the rental truck, which we found out that Jerry didn’t get the optional insurance on! After successfully making it through the stretch of boulders, we had to travel a narrow passage on a mountain side. Being in the passenger seat made this extremely fun for me as I had a bird’s eye view of the 1,000 foot drop we would perish down if we slipped off the side. Both my hands and my feet were sweating with this uneasy situation, but we made it to our destination. We arrived at our parking spot so it was time to head into the mountains. We arrived at our parking spot in the early afternoon so we quickly unpacked our gear and headed out. We only hiked about a 1/4 mile when we decided to make a small camp and do a little evening hunting. We all spread out in a mountain valley and quietly waited for some action. We didn’t see or hear a thing so at dark we headed back to camp. Our camp was a flat piece of earth in the middle of a couple pine trees. We laid down some tarps, our sleeping mats and our sleeping bags. To the laughter of Shawn and Jerry, the two guys who hunted Colorado before, I gathered branches and made my section of the sleeping area barricaded from bears. I figured if I made it tough for the bears to access me and if I had my 40 caliber Smith and Wesson by my side, I’d be okay! After bear proofing my area, we all got nestled into our sleeping bags and pulled a tarp over us like a blanket. This turned out to be a crappy setup for while breathing under a tarp that is inches above your face, the moisture from your breath accumulates and ends up dripping down onto your face. I decided, while trying to sleep, that we would have to try something new the following nights. On the morning of day two, we broke up into two man teams. Shawn would hunt with Jerry, and I would hunt with my buddy Joe. Having the rookies (me and Joe) by themselves didn’t make sense to me, but I figured it would be a blessing in disguise because we would have to learn quick and not depend on others. We headed out. Joe and I started our hike in search of a spot I had marked on my gps during my Google Earth scouting. It didn’t take me long to realize that our destination spot was very unrealistic. We were dealing with adjusting to the higher altitude of the Rockies and the steep inclines and declines proved to be quite the challenge. The last thing I wanted to do is have either one of us have a heart attack or get hurt, so we started looking for a new spot. We came upon a nice mountain saddle that actually had some elk droppings scattered, so we decided to set up camp. After setting up camp, we headed out for an evening hunt. We decided to hunt the same elevated rock that overlooked a nice bottoms. Joe would watch one side and I would watch the other. We didn’t see any, but did hear some distant bugles near dark and that got me pretty excited. The next morning, we split up. Joe hunted the same valley next to where we were camped and I sat to the side of the mountain saddle where we saw some good elk sign. We didn’t see any elk during that morning’s hunt, but Joe had a mule deer at about 15 yards and I did manage to drop a sage grouse from a tree. I guess something was better than nothing; at least we had something new to eat for lunch! After the morning hunt, we decided to try someplace new, so we packed up and headed back to the truck where we could water up and eat our grouse. After leaving the truck, we decided to head North to go up and over a 300 ft ridge and down to the creek bottom on the other side. On our way there, we met two local guys who were doing some calling from the ridge top that we were going to cross. They gave us some pointers and warned us not to go all the way down the 1,500 foot decline to the bottom or it would be hell getting out gear back up, especially if we got an elk. We agreed and left to find a happy medium. Joe and I found a nice open field to the north of a dark wooded slope. We found a place to camp and headed out for an evening hunt. For the evening hunt, we dug into a hillside overlooking the field and a small water hole. The spot looked ideal, but the action wasn’t. That all changed when we had a light colored coyote come and visit us. He stopped at about 70 yards and I took a shot; nailed him! He took off like a bat out of hell, twisting and bucking. I was looking forward to finding him, but didn’t want to ruin the rest of the hunt, I’d look for him in the morning. After the coyote, all we heard were a couple of distant bugles. Still no sign of elk. For this shelter setup, we strung some cordage between two trees to created a low elevated roof over us while sleeping. We knew we would have an initial struggle with the high elevations and we did. Our bodies needed to work twice as hard to get needed oxygen from the thin mountain air and that required not only metering our physical activities, but also meant we needed to drink more water. If you are taking twice as many breaths to get the same amount of oxygen, you are losing breath moisture twice as fast. This can dehydrate you. We packed out with two bottles of drinking water, but when those got drank, we had to tap into the mountain. 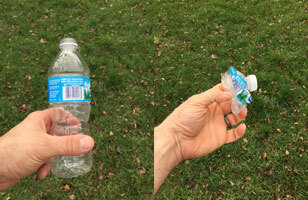 We used bottles that had built in filters to get water from mountain streams. While at the streams, we also reinflated our crushed/empty water bottles and filled those up to bring back to camp. This video shows how we got water from the sometimes subterranean mountain streams. During our sleep between the 3rd and 4th day, it rained pretty hard but let up by morning. We headed out to the same hillside as the night before and got a morning hunt in. No elk again. I attempted to find the coyote, but the night’s rain didn’t help any. I didn’t find him. I did however stumble upon a patch of wild raspberries which Joe and I munched on. Our group was to meet at the truck at noon for a trip back to town where we could discuss what we’ve seen, get a good night’s rest, good meal, and plan the attack for the second half of the trip, so Joe and I packed up and headed out. We met up with the guys at the truck. They saw a couple, but didn’t have any luck. We crammed all our stuff back into the truck and started the drive out. We knew that the nearly impassible 9 mile back country road we had in front of us was going to provide some excitement after the rain we had the previous night, and we were right. We barely made it back thanks to some quick thinking and plenty of branches! Have a look. We made the most of our time back in the town of Steamboat Springs. We did some grocery shopping, bought some more thermal underwear, got a good meal, a hotel room, and most importantly found a good detail shop that was going to try to get out all the “Colorado pinstripes” that the branches along the back country road left on our truck. Like I said before, we didn’t buy the optional insurance, so the truck had to be in mint condition when we brought it back. We needed a miracle! While we were asleep in our hotel rooms, it started to rain. The rain continued into the next day and had no signs of letting up. We dropped off the truck at the detail shop and walked to a nearby restaurant to get some breakfast and talk over our plans for the second half of our trip. Shawn and Jerry were going to hunt an area where Shawn had success a couple years back and Joe and I were going to hunt about a mile and a half to the northwest. Shawn assured us it was a good area and that we should have better luck. We picked up the truck and got ready to go back out. It was still raining. Since the rain wasn’t supposed to stop for a while, we decided to head out in it. Joe and I got dropped off and started one hell of a 2 mile hike through some thick nasty country and then up a 300 foot hillside. When we got to the top of the ridge, we were absolutely soaked. While scanning the other side of the ridge, we saw the back half of an elk before it took off. This was a good sign. We needed to find a place to camp and get out of the weather. We located a boulder along the ridge that could provide a wall for our shelter, so we took advantage of it. 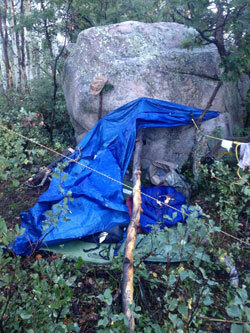 We strung the tarp around the boulder and made a pretty nice shelter. When you’re at the top of a mountain, there aren’t any streams, so for drinking water, we made a rain catch. Daylight faded fast and when the sun drops behind the mountains, the temperature drops 30 or more degrees. Wet and cold, we got into our sleeping bags and slept as best as we could. The morning of day 6, we were glad to see that the rain had stopped and the sun was coming out. Thank God the sun came out. We needed to dry our clothes and focus on the evening’s hunt. We took some rope, made some clotheslines and hung our clothes and sleeping bags to dry. After our clothes dried, we set out for our evening hunt. Joe and I headed down from where we camped quite a bit and hunted some dark woods. As daylight started to fade, the elk were getting pretty vocal. We called back and got return bugles that sounded very close. We tried to close the distance but once again we ran out of daylight. On Day 7, Joe and I were going to stalk out about a mile down to where the area’s biggest creek was and look for some sign. While on our stalk out, we saw a satellite bull that was checking out our area. It was a nice one; a shooter and at about 70 yards. Lucky for him, there was no shooting lane so we tried to get him in closer. We tucked into the hillside and gave a few cow calls. He stood his ground and maybe after not seeing any signs of the cow I was trying to sound like, he took off. We marched on. We hiked all the way down to the creek bottom, stopping periodically to call but didn’t have any luck. We came across a couple of well travelled horse trails with freshly cleared trees. There was evidence that someone had been in the area only a couple of days before clearing these trails with a chainsaw and ,without a doubt, spooking the area. We figured that someone was probably going to guide people in our area during the upcoming gun season which was a couple of weeks away. We headed back to our camp to plan our evenings hunt. That evening, we were going to split up. This was going to be our last evening hunt, so we wanted to make the most of it. Joe tucked into the hillside where we saw the first elk of our trip and I headed farther to the east where our ridge had a perpendicular flat that ramped down between to huge ravines. I found an ideal clearing and had a good north wind in my face. I sat patiently deep in my pine tree ground blind and waited for some action. I saw a doe mule deer but not one elk. As daylight started to fade, the bugling began. I wanted to close the distance fast. I left my ground blind and stalked toward the sound. The bugles led me down a steep mountainside. I slid down the steep hillside about 150 feet and started to call. I gave a few cow calls. What happened next confused the crap out of me. After cow calling, I heard a return call, but it sounded nothing like a bugle. I heard that if the air isn’t just right with the humidity level, bulls have a hard time calling. Maybe this is what was happening? I didn’t know so I called back. The muffled groan answered me. This went on for a couple of minutes and it was getting dark. At about that time, I scanned some of the nearby trees and noticed a ton of bear claw marks. At that moment, something dawned on me; what if the animal answering me is a black bear and he or she isn’t happy with me being so damn close. Or, maybe I sounded like a crippled cow elk and it figured I might be a tasty meal! Whatever the case, it was getting dark and I was getting the hell out of there. I put my headlight on and started to climb the almost 45 degree incline as fast as I could. I stopped halfway up to let my heartbeat drop back down to about 180 BPM and listened. It was coming closer. I restarted my frantic climb. At the top of the mountain side, I listened again. Sure enough it was closing in on me. 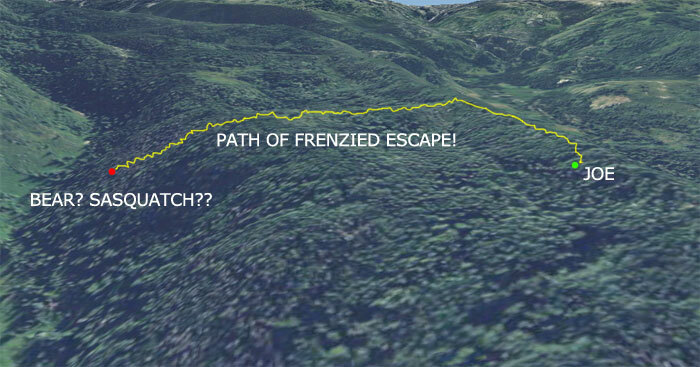 At least now I was at the flat ramp part of the terrain that would lead me back to the ridge where our camp was. The ramp was somewhat of a clearing but covered in tall weeds and fallen pine trees. I had my bow in one hand, my GPS in the other and was trying my hardest to retrace my steps in order to avoid obstacles. Half way back to the ridge, I heard the muffled groan again; whatever animal was following me made it to the flat. I rushed on. On the morning of the 8th day, we split up. Joe would hunt the area where we had the stand off with the bull and I slipped down into the dark woods where we had the best bugling action. Yet again, we had elk sign all over, but very little action. Our chance of killing an elk on our first trip to Colorado was over. We met up at Camp Boulder, packed up, and started the journey back to the rendezvous spot. Our journey was over. It was fruitless in means of harvested game, but very fruitful with what we learned. It was a great experience. We roughed it in the Rocky Mountains with nothing more than what we could fit into our backpacks. We saw some breathtaking countryside, slept under tarps, drank mountains stream water, survived the obstacle courses of the mountains without getting killed and had an opportunity to hunt one of our country’s greatest big game animals. It was a learning experience and I am glad I did it. 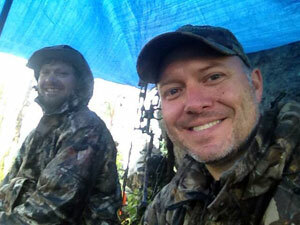 At the truck, we found out that Joe and Shawn did arrow a bull, but lost the blood due to the sporadic rainfall. We headed back to town, got a hotel room, luckily returned the vehicle without getting charged for the damages and flew out the next day. Would I do it again? Hell yes. Here are a few things that I learned from my experience. When scouting online for our hunt, I used the topos of the area to find saddles, pinch points, etc. Well, my being raised in the midwest made feel like an idiot when I realized the severity of the topographical areas I wanted to hunt. 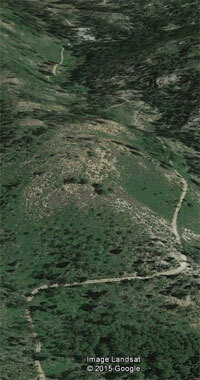 What appeared to be a small saddle between two hills was a valley between two mountains. Learn about and appreciate the tremendous inclines/declines of mountain terrain. Also, be careful when choosing a hunting spot that is far off the beaten trail. Those ups and downs over mountainous terrain are quite the challenge and by choosing a hard to reach destination may be too much when hauling the amount of gear you need for backpack hunting. I learned that the next time I plan a hunt like this, I would look for routes that would run parallel to ridges instead of the up and down travel that Joe and I attempted. It also wouldn’t be a bad idea to start high, maneuver downhill and possibly having a return path that also takes you downhill. Getting dropped off and picked up makes this a possibility. Both Joe and I should have been in better shape. If you would struggle hiking tough terrain at low elevations with a 50-70 lb back pack, the mountains will eat you alive. Buy a weighted vest, get a couple months of cardio in and drop some weight before entering the obstacle course of the Rocky Mountains. I called Colorado’s “plan your hunt” hotline and received information that didn’t really help much. I told the state worker where we were going to hunt and he told us to concentrate on finding elk up high, between 9,000 and 10,000 feet. Well, 10,000 feet was about the highest point around and we discovered that the elk were much lower. 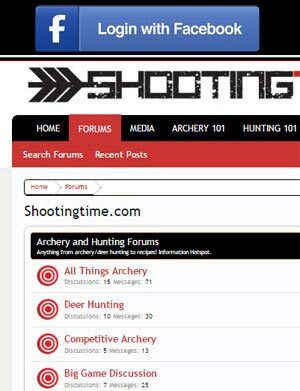 I would suggest hitting the message boards/forums and chatting with hunters who have experience in the area. Some guys are really glad to offer great pointers on where to find elk. Anticipate a wide range of temperatures in the mountains. I called my Uncle, Chris Kent, who is a posse leader of a search and rescue team in the Gallatin Mountain range of Montana, for pointers about surviving in the mountains. He told me to watch for hyperthermia. I told him that the highs for the area we were going to be hunting would be in the 70’s and he said to still be prepared. I didn’t know what he was talking about until I was in the mountains and felt the temperature rapidly plummet when the sun set. What was a hot 70 degree day turned into a chilly 40-50 degree evening/night. Next trip, I will definitely pack more cold weather gear. Shawn set the timeline of our trip not to conflict with a fishing tournament he was going to attend. I think this was one reason we didn’t see much aggressive bull elk activity. Next time I head out for elk, I will make sure I’m getting there at a time of peak activity. While being in the mountains for a long stretch of time, you most likely will get rained on. The Eberlestock Blue Widow backpack I used was a quality backpack but was far from waterproof. My clothes and everything else in the pack got wet. Joe, on the other hand, had a cheaper, one large compartment, waterproof backpack that kept his clothes dry. His backpack didn’t have the functionality or the metal frame of mine, but it kept his gear dry. When it’s cold and wet, having a quality waterproof backpack can be a big plus for comfort. Joe and I definitely didn’t utilize this calling technique. I think Joe and I underestimated an elk’s ability to pinpoint the location of a caller in mountainous terrain. Maybe it was all of the hunting shows that showed bulls charging in to within 5 yards of the caller, I don’t know. This was really clear the night we had many callbacks but just didn’t get the bull close enough. Had I, the caller, set up 80 yards behind Joe with bow in hand, we may have seen different results. I hope you enjoyed my experience and maybe learned something as well. If you’re going to try public elk hunting in Colorado, I wish you the best of luck. Periodically check our website for our new upcoming elk hunting section that will be located on the Hunting 101 page. Good luck!